The International Budget Partnership’s Open Budget Survey (OBS) is the world’s only independent, comparable measure of budget transparency, participation, and oversight. The Open Budget Survey 2015 examines 102 countries from around the world, measuring three aspects of how governments are managing public finances. Budget transparency: the amount, level of detail, and timeliness of budget information governments are making publically available. Each country is given a score between 0 and 100 that determines its ranking on the Open Budget Index. Budget participation: the opportunities governments are providing to civil society and the general public to engage in decisions about how public resources are raised and spent. Budget oversight: the capacity and authority of formal institutions (such as legislatures and supreme audit institutions) to understand and influence how public resources are being raised and spent. The Open Budget Survey 2015 finds that 98 of 102 countries surveyed lack adequate systems for ensuring that public funds are used efficiently and effectively. Each of these 98 fall short on at least one of the key pillars of budget accountability: budget transparency, public participation, and formal oversight. Thirty-two countries fall short across all three pillars. Download resources below to learn more. 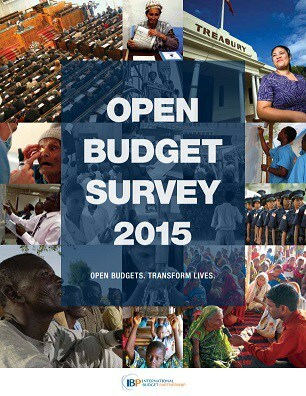 The Open Budget Survey 2015 full report is the most comprehensive resource available for download. It includes information on the research methodology, key findings, country rankings, and more. This abbreviated summary includes a summary of findings on the state of budget transparency, recommendations to improve budget transparency, participation, and accountability, and the Open Budget Index 2015. This abbreviated summary focuses on key findings from the Open Budget Survey 2015. The Open Budget Index 2015 assigns countries a transparency score on a 100-point scale using 109 questions from the Open Budget that focus specifically on whether the government provides the public with timely access to comprehensive information contained in eight key budget documents. Key findings from the Open Budget Survey 2015, visualized. Learn more about the research methodology used for the Open Budget Survey 2015. The results for each country in the Open Budget Survey 2015 are based on a questionnaire, comprising 140 questions, that is completed by independent researchers typically based in the country surveyed. Almost all of the researchers responsible for completing the questionnaire are from academic institutions or civil society organizations that have a common interest in promoting transparent and responsive budgeting practices in their countries. Researchers were also provided the Open Budget Survey Questionnaire Guidelines which described the method to be used in completing the questionnaire and defined the types of evidence to be provided.